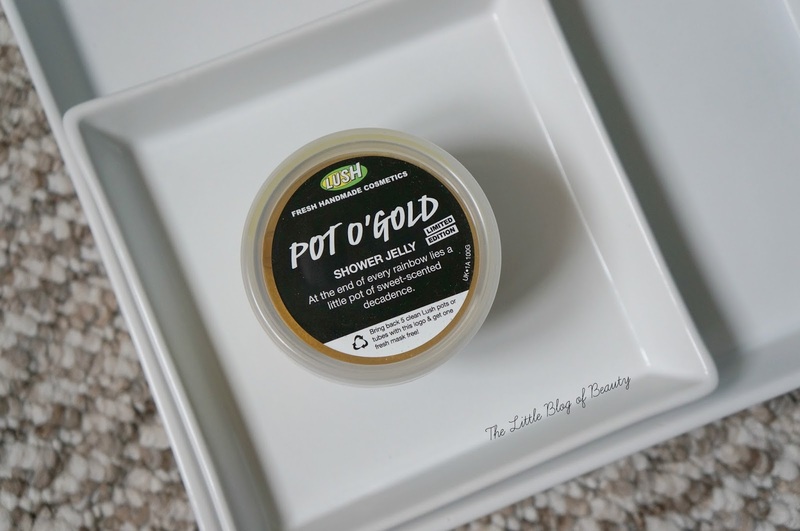 I'm aware that this was an Easter limited edition and so isn't available any more but as Lush have three shower jelly's in their permanent range I thought I'd review the product in general as well as Pot o' Gold in particular. If you're not familiar with Lush's Shower jelly's these are just like a jelly you would eat (but I wouldn't recommend it!) that you use as a 'solid' shower gel. You tip the pot up and the whole thing comes out in one piece. You can either use it like that or you can try and pull a small section off, although this isn't easy to do. I noticed Zoe London say she uses scissors to snip small pieces off to use. Whichever way you chose to use it as you can probably imagine it's not the easiest product to keep hold of. It's likely you'll end up chasing it around the shower at least once as unless you keep a good grip on it it does like to slip through your fingers and flubber around a bit. 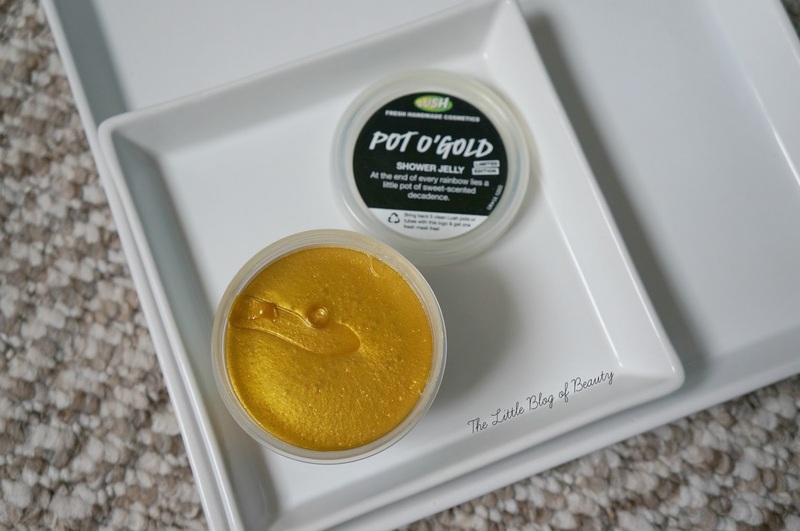 I was introduced to Pot o' Gold when I headed to Lush Meadowhall for an Easter preview and the sparkly gold appearance and caramel/toffee scent meant I couldn't resist picking one up before the Easter range disappeared from stores. It looks amazing and smells just as good. This does obviously contain some glitter to give it the sparkly appearance but I don't find that any of this sticks to my skin. This one contains fresh pineapple juice, Fair Trade vanilla absolute and sweet orange oil. I'm not sure how long these last as I've only used this twice but I can see that it's a little smaller than it was. The flat surface was almost perfectly smooth when it was new but since I've used it it's started to develop little holes in the surface so it now looks a bit like honeycomb, which for some reason I love. It's not the best for lather but it's a fun product to use that smells amazing and leaves you feeling clean. If you like the sound of Pot o' Gold you can get hold of Deep Sleep, a bright orange containing lavender, camomile and orange juice, Sweetie Pie, a sparkly deep purple containing cherry, coconut and blackcurrant and finally Whoosh which is a sparkly teal green with lemon, grapefruit and lime. Sweetie Pie and Whoosh both sound amazing and I'd definitely consider trying them in the future. Did you try Pot o' Gold while it was around? Wow I've never seen these before! Definitely need to investigate more from LUSH. 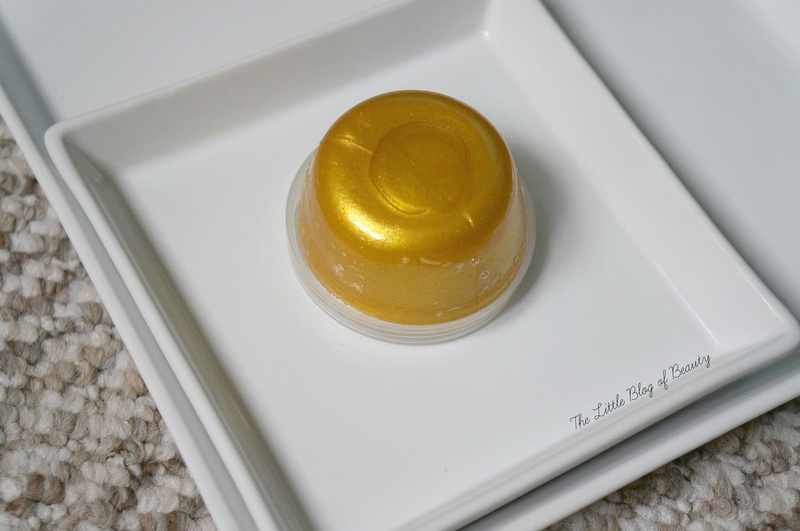 I have never really used the shower jellies before, but this one looks great! I love how it is glittery and the ingredients sound lovely. Might have to pick one up! I never knew they had Shower Jelly! I really want to try them out, the thought of chase it around my shower did make me laugh haha!